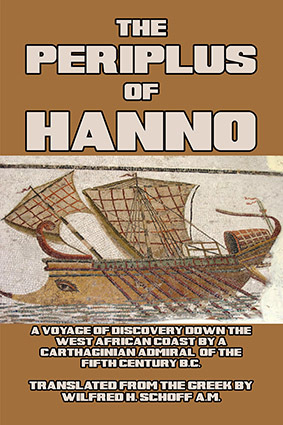 The Periplus of Hanno: A Voyage of Discovery down the West African Coast, by a Carthaginian Admiral of the Fifth Century BC. By Hanno. Translated by Wilfred H. Schoff, A.M. One of the only surviving complete documents from the great city of Carthage, written by the admiral Hanno at the height of his city’s power, this remarkable work describes the fifth century b.c. attempt to reach the equator by sailing south along the African coast. The author, who also reigned as king of Carthage from 480 until 440 b.c., was sent out at the head of a large fleet of ships to explore and colonize the northwestern coast of Africa. He reached as far south as the present-day African state of Gambia, and as he traveled, described the native people he encountered—for all of whom he was without doubt the first white person they had ever seen. 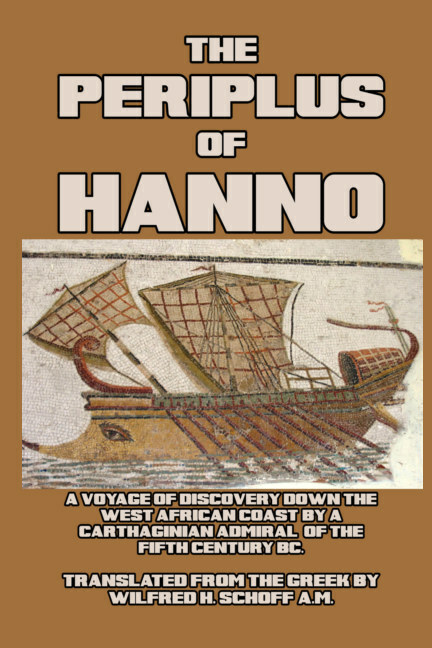 Hanno’s short account was copied by an unknown Greek traveler, and in this way the document was spared the subsequent total destruction of Carthage by Rome following the last Punic War. This edition contains a number of accompanying essays by historians which put Hanno’s work into historical perspective. They include a chronological account of Carthage’s rise and fall, a description of the route taken by Hanno, a detailed account of the city of Carthage and its population, empire, and trading partners—and its ultimately fateful interaction with the Africans. A highly complete and satisfying work of a long-hidden historical period, now completely reset and illustrated.